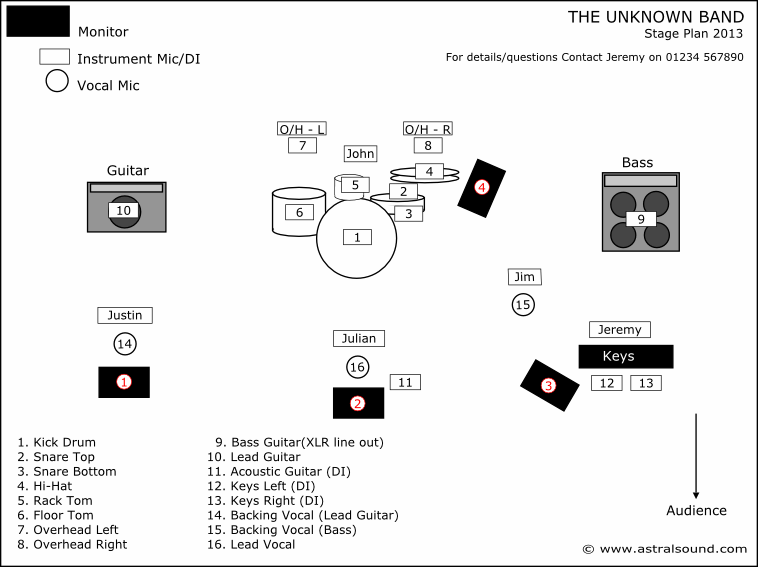 Below is an example of a stage plan. It doesn't need to be particularly elaborate (you don't need a desktop publishing suite: a hand drawing is just as good). Its main purpose is to give people who are setting up the stage an idea of where everything will be. This means the sound crew can set up most of the microphones and stands - and the lighting crew can also prepare - without having to wait for the band to arrive. Useful information to include (bottom-left) is a list of what everything is, preferably with numbering that corresponds with your Channel List. If you are sending a stage plan to someone else, don't forget to put the name of the band on it! Contact details are useful, too.